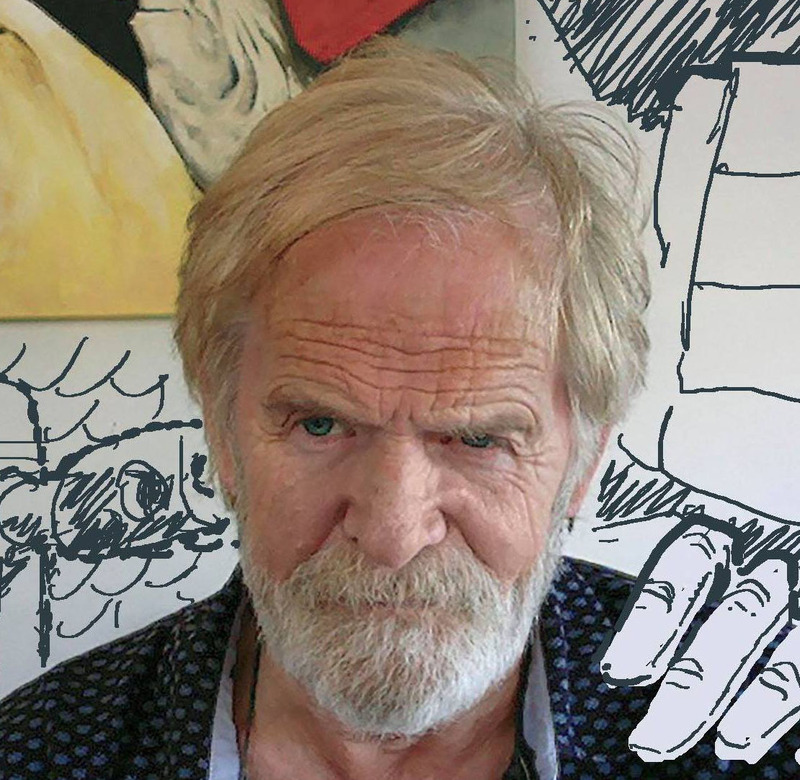 Carlos Ezquerra, one of the co-creators of Judge Dredd and a leading artist in British comics, albeit remotely from Spain for most of his career, died on Monday, 1 October 2018 at the age of 70. He had recently undergone surgery for cancer of the lung and had posted a very positive message on 14 September about the outcome. Complications following his operation prevented him from attending the ICE Convention in Birmingham. He was to have been a special guest at the Heroes Comic Convention in Madrid where he was to have received the Jesus Blasco Lifetime Achievement Award. He was a Will Eisner Award Hall of Fame nominee in 2018. Carlos was a lynch-pin of 2000AD from the beginning. When the comic was in development, writer John Wagner had suggested it needed a futuristic cop and pitched a violent, Dirty Harry clad in black leather in near future New York. Carlos took the image of a helmeted David Carradine in Death Race 2000, and adorned him with chains, a huge badge, knee pads, oversized boots and an eagle shoulder pad to create the original look of Judge Dredd – the name borrowed from a rejected occult character Pat Mills had been developing. It was Carlos who first envisaged the huge futuristic skyscrapers and high-rise roadways that became the architectural look of Mega-City One and, while other artists helped develop the look of the strip (notably Mick McMahon and Brian Bolland), Carlos's template was the foundation on which was built a world that has lasted for over forty years. Carlos drew only a couple of early episodes – he was kept busy elsewhere – but returned to Dredd with 'The Apocalypse War' in 1982 and thereafter was integral to the strip, drawing many of the key storylines, including 'Necropolis', 'Judgement Day', 'Inferno', 'The Pit' and 'Origins'. A statement from 2000AD said: "He has been one of the pillars, producing the same dynamic, enthralling and arresting art we always loved him for. We thought we had many more adventures to come from the master, so we are devastated to discover we were wrong." Carlos Sánchez Ezquerra was born in the small Spanish municipality of Ibdes in the province of Zarazoga, 200km north east of Madrid, on 12 November 1947. Carlos was a regular reader of comics from an early age in a country where youngsters without the money to buy comics could hire them cheaply in shops, to be read quickly and returned. In this way Carlos was able to read a great many syndicated American strips – Rip Kirby, Prince Valiant, Juliet Jones, Mandrake the Magician, etc. – although many were censored. During his military service he met an artist who explained how comics were put together and, on completing his conscription, he moved to Barcelona, where, around 1969, he was employed drawing westerns, war and horror stories for Spanish comics published by Ediciones Boixher, Vilmar Ediciones and Editorial Presidente, which he signed Sanchez Ezquerra. He quickly found work in the UK through Bardon Art, initially on IPC's teenage girls' comics Valentine and Mirabelle and then adventure strips such as 'Chained To His Sword' and 'Strongbow' for D C Thomson's Wizard. Newly married, Ezquerra decided to move to England for a few months, settling in Croydon where he stayed for nine and a half years. His work was spotted by John Wagner, who was involved in the development of a new weekly war comic, Battle Picture Weekly, and Carlos was taken on as the chief artist on the Dirty Dozen-inspired 'Rat Pack', which debuted in the first issue. It was with this strip that he began experimenting with more dynamic layouts following the rigid confines of the work he was expected to draw for Wizard. This new dynamic style was visible in 'Major Eazy', a laid-back, laconic commander of British troops during the invasion of Sicily. The ice-cool Major borrowed his looks from James Coburn and his attitude from Clint Eastwood, and it was here that Carlos's style began to emerge. "He was my kind of character, an anti-hero" Carlos later said. "It also suited me that he was scruffy. My art has never been very clean. Everything looks dirty with me, so Eazy fitted perfectly." 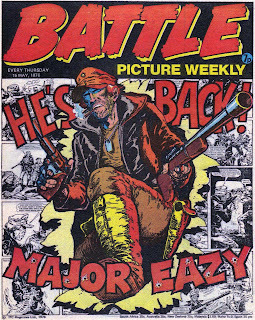 It was his commitment to a team-up between Major Eazy and Rat Pack in the pages of Battle that meant Carlos was unavailable to draw Dredd from the beginning. Still with Battle, he drew another Alan Hebden story, this one set during the American Civil War featuring a black gun for hire named 'El Mestizo'. 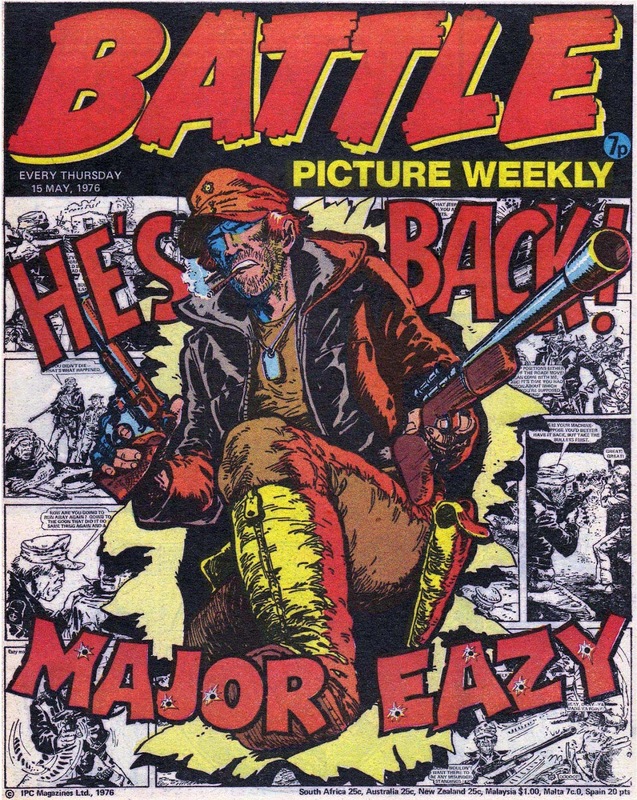 During his time on Battle, Carlos also drew one of the most controversial covers to appear on a British comic. The issue of Action dated 18 September 1976 featured an Ezquerra-drawn image based on the strip 'Kids Rule OK' showing a violent youth swinging a chain at a prostrate man. Because of the nearby policeman's helmet and the choice of the colourist (not Carlos) to give the man a blue jacket, shirt and trousers, it was mistakenly seen as a thug attacking a police constable. This was the view of the Daily Mail, who condemned the cover in an article headlined "Comic Strip Hooligans". 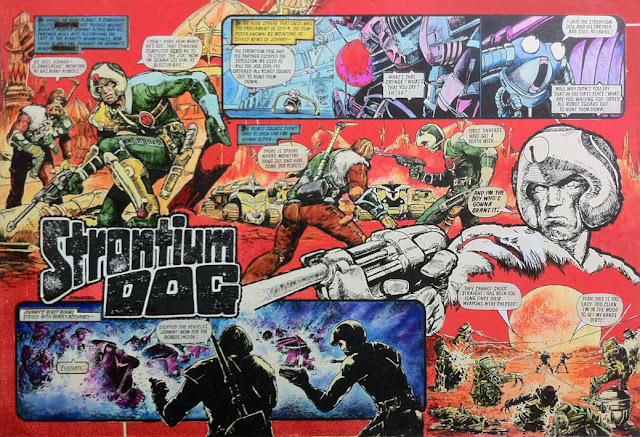 The arrival of Starlord, the second science fiction launch from IPC in the wake of the success of 2000AD, brought with it another iconic Ezquerra character, 'Strontium Dog'. Written by John Wagner, the strip made a star of Johnny Alpha, a bounty hunter seeking out mutants in a post-Nuclear War Britain for the Search/Destroy Agency whose operatives are nicknamed Strontium Dogs. When Johnny Alpha died in the 1989-90 story 'The Final Solution', written by Alan Grant, Carlos refused to draw it, believing that killing off the character was a mistake, a viewpoint Wagner later came to agree upon, later calling it "one of the big regrets of my career, probably the biggest." The characters were revived by Wagner/Ezquerra in 1999 and the latest Johnny Alpha serial ran as recently as May 2018. In between series, Carlos drew numerous one off stories featuring Tharg, 2000AD's alien editor, and episodes of 'Rick Random' and 'The ABC Warriors' under the pseudonym L. J. Silver, used when a job had to rushed. A more substantial strip was his adaptation of three novels featuring Harry Harrison's famous Stainless Steel Rat character and a short horror story, 'Fiends of the Eastern Front' by Gerry Finley-Day, which has resonated with readers since its original appearance in 1980. 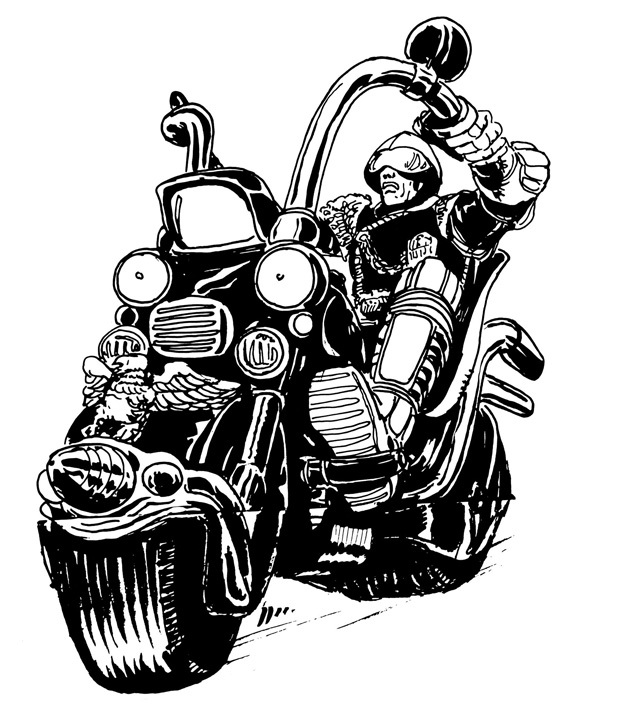 Outside of 2000AD, Carlos drew 'Comrade Bronski' for Eagle. 'Third World War' in Crisis and 'Al's Baby' in Judge Dredd Megazine, the latter another fan favourite which spawned two sequels. In 1995, Carlos drew the 4-issue series Bob, the Galactic Bum for DC Comics. 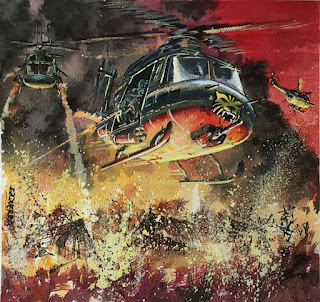 Written by 2000AD stalwarts John Wagner and Alan Grant, it opened up a new market for his work, where he was championed by Garth Ennis, the two working together on Bloody Mary (2 x 4-issues), Hitman, Preacher, Adventures of the Rifle Brigade (2 x 3-issues), Just a Pilgrim (2 x series), The Magnificent Kevin (2 x 5-issues) and Battlefields (2 x 3-issues). He also contributed to the Star Wars universe with the 6-issues series Mara Jade: By the Emperor's Hand by Timothy Zahn and Michael A. Stackpole. 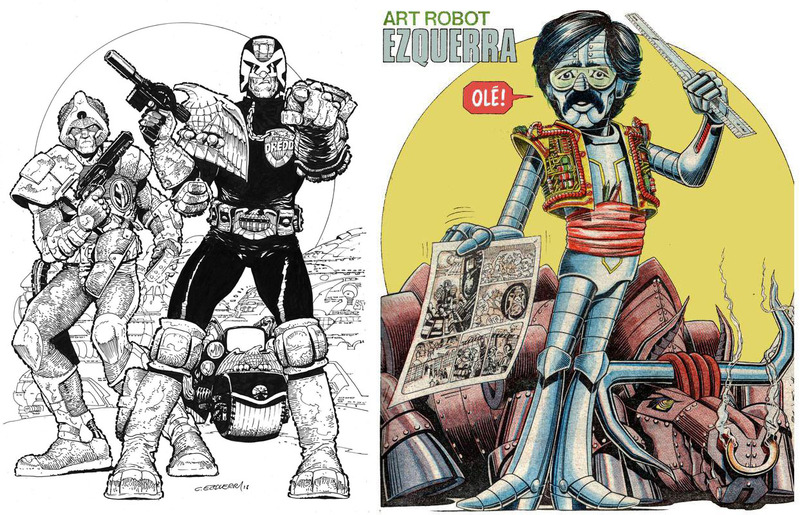 Despite these diversions, Carlos remained a key artist with 2000AD, chiefly on 'Judge Dredd' – a unique collection of his work, Judge Dredd: The Carlos Ezquerra Collection, was published in 2007 – and 'Strontium Dog' but also with new characters such as 'Cursed Earth Koburn' by Gordon Rennie, who debuted in Judge Dredd Megazine in 2004. He had recently been working on 'Spectre', a new series with John Wagner about an android detective. Carlos's strips have been widely reprinted and, here in the UK, a number of his older strips were in the process of being collected. Appearances in Rebellion's recent output have included the volumes Cadet Anderson: Teenage Kyx (2017), Strontium Dog: Repo Men (2018) and the upcoming El Mestizo (2018). 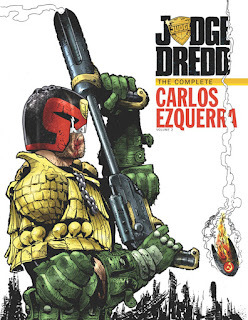 IDW published two volumes of Judge Dredd: The Complete Carlos Ezquerra in 2013. In September 2017 Millsverse published Carlos Ezquerra's 2000AD & Judge Dredd Colouring Book featuring 50 images to colour. Ever friendly, Carlos was a welcome visitor to UK and international conventions where he was a hugely popular figure in artists' alley. Not only was a fan favourite, but a favourite amongst the professionals he worked with. When it was announced in 2010 that he was suffering from lung cancer, a secret project was launched to create a one-copy get-well-soon comic, Supersquirrel Undefeated, with contributions from fans and professionals. The single printed copy was given to Carlos, who survived the cancer but at the cost of a lung. He was not so fortunate when cancer struck again. Carlos is survived by his wife Conchita and two sons. Tributes are appearing widely, but here are links to Down the Tubes and to Lew Stringer's Blimey! to get you started. The Organización del Cómic de Zaragoza have announced that they will be publishing a special edition of the Tebeíco del Salón dedicated to Carlos, to be published in time for the 17th Salón del Cómic Zaragoza, an annual convention celebrating Aragonese comics and creators. Carlos was the guest of honour at the convention in 2013 and received their Gran Premio de cómic aragonés award in 2014 in recognition of his career. A JustGiving page to raise £2,000 to assist Carlos's family reached its target in one day and reached over £3,000 after two days. On 6 November, John Wagner noted on Facebook: "I have received from Dale Jackson the princely sum of nearly £4000 raised by fans as a mark of their love and respect for Carlos. I will send your gift to Carlos's family and I know they would wish me to pass on their thanks and appreciation to Dale for his efforts and to all who contributed to the fundraiser. Carlos always said 2000AD fans were the best." Thank you for this insight into Carlos life and career. He was a brilliant inspiring artist with a unique style that has left us far too soon. Steve you wrote Wednesday as the day he passed away when it was Monday. Carlos was one of the few Spanish artists who never worked in Spain and had most of his career working for British comics. He was, along with Dave Gibbons, the most successful artists Barry Coker (from Bardon) handled. He'll be missed by his many fans. It's a popular misconception that Carlos never drew anything for his native Spain. Certainly in his early career he contributed to a number of comics. The earliest I know of is the western "Nevada Smith en ¡¡Implacable!!" in Nevada el solitario, published in 1969. He contributed to La conquisa del oeste, Dakota, Fórmula 1 Aventuras and a number of horror comics before establishing himself in the UK. Lovely tribute and very informative. Thanks, Steve.